One of the best parts about dentistry is that the technology is constantly changing, giving the team at LakeView Family Dental the ability to work with more speed and precision while also keeping patients more comfortable. Thanks to our advanced tools and services, we can now give you so much more than a beautiful, healthy smile! If you’re dealing with dental anxiety, jaw pain, or even sleep problems, read on below to learn how we can help you! Why Choose LakeView Family Dental for Advanced Services? We understand that our patients are busy and that is why we have invested in CEREC technology. Using CAD/CAM software, we’re now able to design, fabricate, and place a completely custom dental crown in just one quick appointment. The entire process of creating your new crown happens right before your eyes, while you wait. You leave with a beautifully restored crown, no follow-up visits required! Our goal is to make needing dental visits as seamless as possible. That is why we offer in-house implant placements for our patients. No more hassle of traveling between specialists. We perform the entire procedure here at LakeView Family Dental. From your first consultation all the way until you walk out of our dental office with a new smile, you’ll be able to work with the same doctor and team that you trust, leading to a smooth and stress-free experience. The TMJ is the joint that allows your jaw to move in all directions, essentially giving you the ability to eat, speak, laugh and yawn. Like other joints in the body, it can sometimes develop problems due to stress, strain, or injury, leading to painful symptoms such as a stiff and aching jaw, persistent headaches, and even soreness in the neck and shoulders. At LakeView Family Dental, we’re able to diagnose and treat these kinds of issues, helping our patients get the relief they need. Yes, you can now get Botox at the dentist’s office! Our team has been specially trained to safely and effectively use this trusted treatment to help patients with fine lines and wrinkles. With just 10 minutes and a few painless injections, we can lighten and practically eliminate noticeable wrinkles on the forehead and around the eyes, nose, lips, chin and neck. At the same appointment, we can beautify your smile and give you smooth and supple facial skin, helping you look a decade younger in just an hour or less! Many patients struggling with sleep apnea are unaware that their dentist can offer them a safe and effective CPAP alternative that literally fits in their pocket. 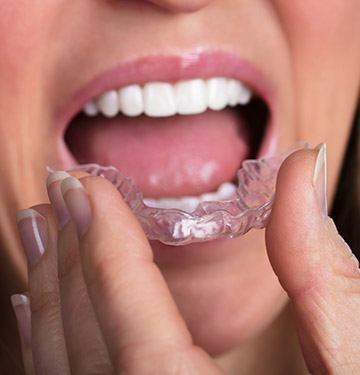 Using a custom-made oral appliance, we can keep the airway open during sleep to help patients stop snoring and experiencing apnea symptoms. With just a small mouthpiece, patients are able to get the rest they need and wake up feeling energized in the morning. Our intraoral camera will literally give you a whole new perspective on your smile. This small, camera-tipped wand can capture close-up, high-resolution images of the teeth and gums that we can instantly display on a monitor right in the treatment room. These images can serve as an excellent visual aid, offering patients better understand their dental needs while also allowing our team to show them why they might benefit from a specific treatment. 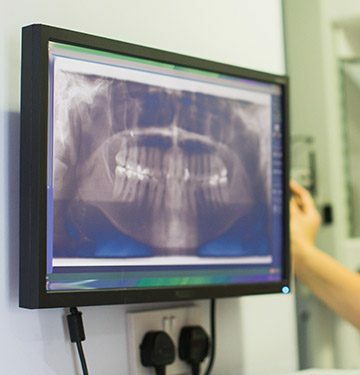 X-rays give us the ability to catch and diagnose many dental problems before they are even visible to the naked eye, and to make this tool faster and safer than ever, we’ve gone completely digital. 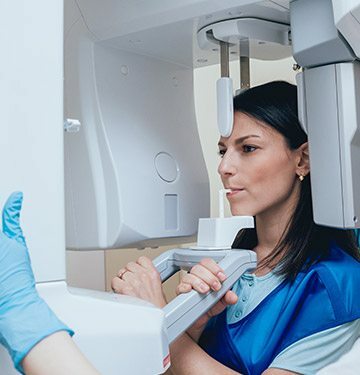 Compared to traditional film X-rays, digital X-rays take less time, capture more detail, and they even reduce the amount of x-rays by up to 90%. Plus, they don’t require toxic darkroom chemicals to be processed, making them better for the environment. When planning more advanced treatments like dental implant placement or root canal therapy, we want to have as much detail as possible so we can complete the procedure with extreme precision. This is when we like to use our Cone-Beam scanner. With it, we can create a fully 3D X-ray image of the teeth and jaws. With this information, we can better personalize a procedure to a patient’s dental anatomy, ensuring a successful treatment and a speedy recovery.